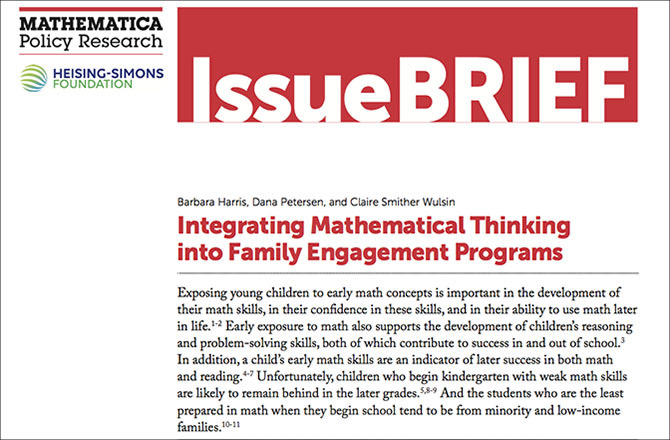 The nonpartisan research organization Mathematica Policy Research recently developed an issue brief documenting the ways in which five family engagement organizations—all Heising-Simons Foundation grantees—developed and tested integrating math into their programs. 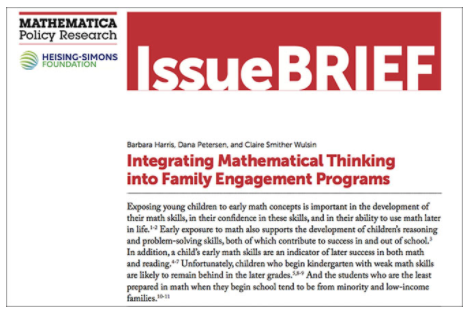 This promising strategy leverages caregivers’ ability to engage children in playful learning experiences and aims to strengthen children’s early math skills, support later school achievement, and foster positive attitudes towards math. Tip #7: Use data for learning and improvement. We thank our grantees Abriendo Puertas, California Head Start Association, The YMCA of Silicon Valley, Reach Out and Read, and the Santa Clara County Office of Education for sharing their experiences. To read the full brief, click on the image below.